The electric kettle for coffee is a special type of kettle that has been designed with a strict temperature control inside that will allow you to brew the perfect cup of coffee. Sure, you can always use a regular kettle to boil your water for your coffee. However, you will not get the accuracy in temperature because the regular kettle was not designed to provide for the temperature sensitivity for coffee brewing. Moreover, most top-rated electric kettles have an auto-off function that will automatically turn off the kettle for safety reasons. They also have a “keep warm” feature so that you do not have to constantly keep warming your water. You can also read other product reviews such as pour over kettle, electric gooseneck kettle. 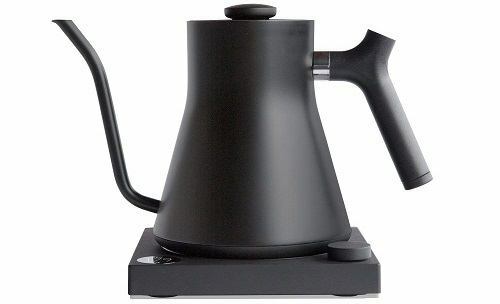 This OXO coffee kettle is a popular model that you will find in the home of many expert baristas. What makes this kettle unique is its low weight of 1.13 lbs and portable form factor. Indeed, the OXO is a cordless coffee kettle that is very maneuverable. Furthermore, the spout is quite long and designed in such a way that it will prevent spillage. Also, due to this long spout, you do not have to tilt the kettle much for the water to start flowing. And when it comes to the build construction, it is quite durable and aesthetically pleasing as well since it is made from corrosion-free stainless steel. And to justify its relatively high price, this model has features like auto-off, keep warm and is perfectly food safe. If you only have a small budget, then this coffee kettle by AmazonBasics is the best electric kettle for coffee in this review when it comes to price. Despite its small price, this model still has features like auto-off to conserve electricity as well as a boil-dry feature which will lock the power if the kettle is empty. You will also appreciate the fact that this kettle comes with a 1-year manufacturer warranty despite being a budget model. All in all, you have nothing to lose when choosing this AmazonBasics coffee kettle. Despite the Fellow Stagg being the most expensive coffee kettle, we have to offer in this review; it is also one of the best electric kettles with temperature control we have ever reviewed. Indeed, this model has many advanced features, and you can even get a model that comes with Bluetooth so that you can control it at a distance with your smartphone. Moreover, when it comes to electricity, this unit consumes 1,200 W which is a slightly lower energy usage when compared to competing models. But what really makes this coffee kettle stand out is its polished black look that is made from high-grade stainless steel that will not corrode, is very durable and long-lasting. Moreover, on the stand of this coffee kettle, you have a large knob that allows you to quickly and easily adjust the temperature. The only caveat we note with this product is its heavyweight of 4.52 lbs. However, this weight includes the base, and since this is a cordless model, it still remains quite maneuverable when pouring water. Many users of the Fellow Stagg have complained that it is difficult to get a warranty and get in touch with customer support. We don’t expect that you have any problem with this kettle, but it is still something to keep in mind. 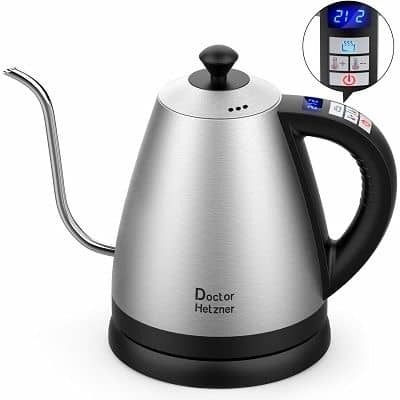 When compared to other kettles, the Doctor Hetzner stands out by offering you a larger capacity of 1.2 L. Sure; this is not much but still significant especially if you are the type of person who likes to prepare a large coffee serving where a lot of hot water is necessary. 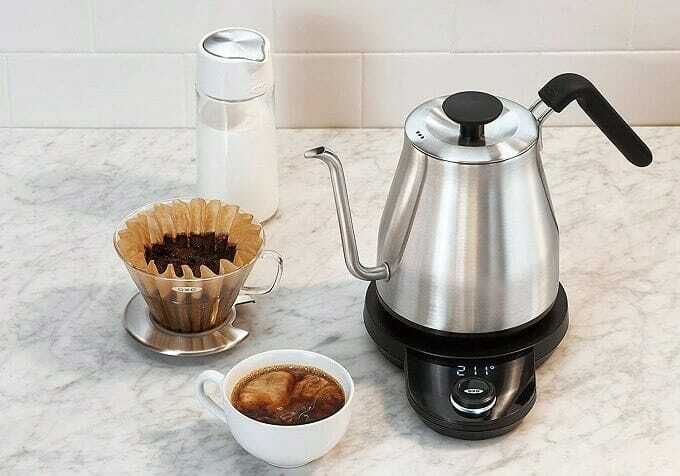 Moreover, since this coffee kettle consumes only 1,000 W of electricity, it is significantly more energy efficient than other models we have in this review. What we also like is that there is a temperature control display on the handle itself that will show you at all times the temperature of the water. Also, you can adjust the temperature as well as shut down or power on the kettle right from the handle buttons. When it comes to building construction, you have nothing to worry about because it is made from stainless steel which is BPA-free and corrosion-free. 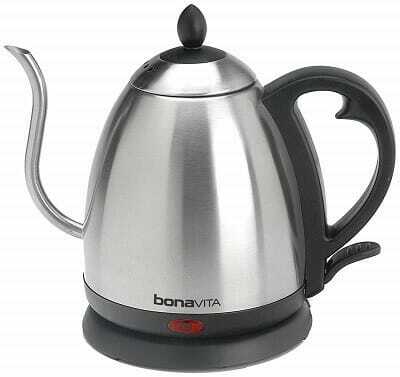 Due to the long spout of this coffee kettle, it will reduce water spillage significantly you also do not have to tilt the kettle a lot for the water to start flowing. Very neat! The Willow & Everett is regarded by many of its users as being one of the best electric kettles for the money. This is because this model has the best price to performance ratio of any kettle that you can find on the market. 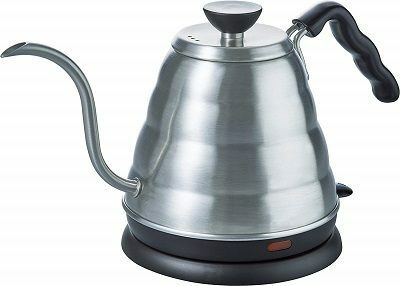 Also, it comes with many handy features like an indicator light that will show you when the water is boiling inside the kettle, as well as relatively low power consumption of 1,000 W. The build construction is made from a BPA-free stainless-steel material, so it is perfectly safe to boil water. Since it is cordless, it remains quite maneuverable. Furthermore, the long spout means that you will not have to tilt the kettle much which makes it both safer as well as easier to use. 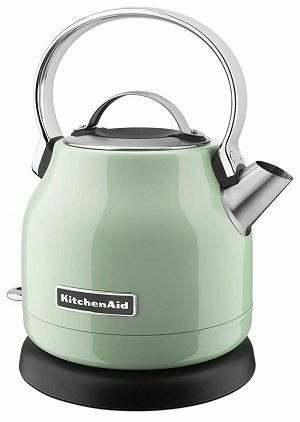 The KitchenAid tries to re-create the feeling of using a traditional kettle to prepare both tea and coffee. 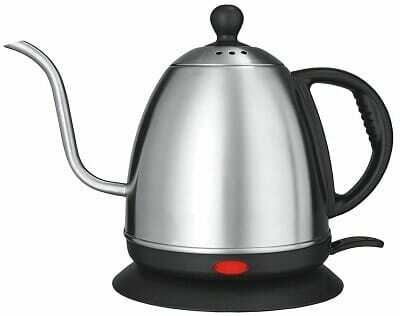 This model sports a higher than average capacity and has an LED indicator that will show you when the kettle is on or off. Moreover, it is portable with a removable base so you can maneuver this kettle with ease when brewing your coffee. The body is made from high-grade stainless steel which will not corrode. It is also quite aesthetically pleasing and sports a mirror finish. On the other hand, the handle is made from aluminum. The only shortcoming of this kettle is its fairly high price as well as short spout which means that you will have to tilt this kettle to a steeper angle for the water to start flowing. The Stonn Gooseneck is an average capacity coffee kettle that can accommodate 1L of water and has a weight of 2.17 lbs. This includes the weight of the base, and since this is a cordless kettle, the weight of the kettle alone makes it quite maneuverable. There is a red indicator light that shows you if this kettle is switched on or off, and the handle is ergonomic. In fact, the handle has finger rests that makes it a pleasure to hold. Since this is a budget kettle, it does not have a temperature control or other advanced features you find in more expensive models. What we like about this kettle is its long spout that does not require a lot of tilting for the water to flow. Additionally, since the spout is small, you have more control over the amount of water that flows out of it. 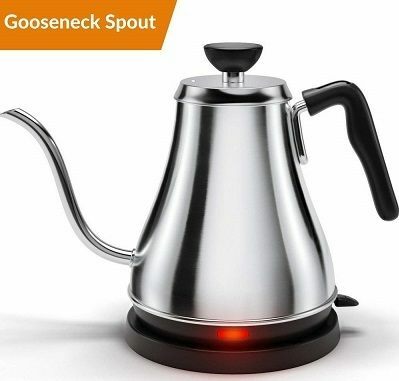 All things considered, the Stonn Gooseneck is one of the best electric kettles for coffee especially for those with a small budget. There is a small mildew odor in this kettle that is probably a residue from the manufacturing process. Thoroughly clean the inside before every use! Not everyone can afford an expensive kettle for coffee. Luckily, this is where models like the Hamilton Beach comes into play. Not only is this coffee kettle affordable, but it also sports decent features as well as a large capacity of 1.7 L.
In fact, you won’t find a higher capacity model in this electric kettle for coffee review. With such a big capacity, you will be able to make a large coffee serving with ease. Moreover, the side of this kettle has a transparent gauge that will allow you to see the water status at all time. And last but not least, there is a red indicator light that switches on every time the kettle is working which is a great safety feature. The Hario V60 is a popular kettle used by many coffee experts. It sports a long spout that has been designed in such a way to provide you with more control over the flow of water. Additionally, the spout is such that you do not need to tilt the kettle to an excessive angle for the water to start flowing. Coupled with the fact that this coffee kettle weighs only 1.76 lbs, it is highly maneuverable. Despite its small capacity of 0.8 L, you can still use it to boil water for a large coffee serving. And we cannot review the Hario V60 without talking about its excellent and ergonomic handle. It is slanted in such a way so as to provide maximum comfort when handling. One of the best features of the Bonavita is definitely its excellent price to performance ratio. This model has the right balance of everything, except for temperature control. It uses 1,000 W of electricity to heat up water, which makes it quite energy efficient since there are many equally performing and pricier models that can consume up to 1,500 W. Moreover, this is a portable model hence it is quite maneuverable when serving. The base is made from hard plastic and has a 360-degree swivel which is practical. To the side, we find a red indicator light that shows you the status of the kettle. The handle is also large and ergonomic and solidly attached to the kettle. But what we like the most about this kettle is the fact that it comes with a solid 2-year warranty. This unit is a compact and slim kettle made from high-grade stainless steel. This makes is an aesthetically pleasing kettle that is also durable and long-lasting. Moreover, it has a conservative weight, so it is maneuverable as well. But what makes this kettle really one of the best stainless-steel electric kettles on the market is its large water capacity of 1.7 L. You will be able to prepare a large coffee serving with this kettle. And since the capacity is so big, it becomes a versatile kettle that can also be used for any scenario where hot water is required. The only caveat is the price could have been a little better. But minus this small issue, the Chef’s is a versatile and practical coffee kettle. 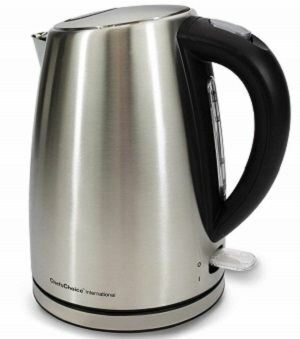 We recommend this kettle only for casual use where you have to boil water only twice or thrice daily. Not recommended for heavy-duty use. You may have heard about Cuisinart. After all, this company makes some of the best electric kettles for coffee on the market. This product is no different. It has a high-capacity of 1.7 L which will allow you to brew a large coffee serving. Moreover, the backside of this coffee kettle has a transparent window so that you can view the water level at all times. The base is solidly made from stainless steel and has a 360-degree swivel which means that it is easy to remove this cordless electric kettle. In addition, the base uses a special technology that keeps it cool even when the water is boiling. You will have no risk of electrocution or scalding with this coffee kettle, so it is perfectly safe. And one outstanding feature of this coffee kettle remains its removable spout filter so that you can clean it more efficiently. The boiling speed is an important factor to consider in a coffee kettle. This is because you do not want to waste a lot of time waiting for your coffee to boil. Luckily, kettles for coffee has been designed in such a way that water boils faster and uses less energy. 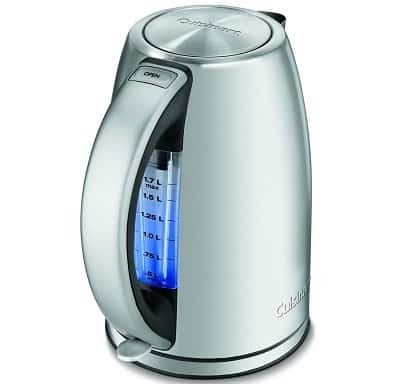 Most of the time, a top-rated electric kettle should be able to boil water in less than 5 minutes. Go with a model that has a similar boiling time or less in order to save precious time. Capacity in a coffee kettle goes hand-in-hand with the number of coffee servings that you need to make. Evidently, the more coffee you need to serve, the higher the capacity the kettle must be. For most people and especially casual coffee drinkers, a coffee kettle with a capacity of 1 L is more than enough. However, if you need a larger capacity, then go with a model that has a capacity of 1.5 L or more. When purchasing a coffee kettle, keep in mind that the material used in the build construction of the coffee kettle will dictate how long-lasting and durable it is. Most manufacturers add up stainless steel in their build construction because it is relatively cheap, aesthetically pleasing, and corrosion free. This means that it will not develop rust when it comes in contact with liquids. Additionally, the material used in the inside of the coffee kettle is important to consider. It must be made from a material that is corrosion free and not reacts with the coffee because this will spoil its taste. Modern coffee kettles come with various temperature options like an auto-power off when a certain temperature is reached. This is a safety measure that will prevent the coffee kettle from consuming an excessive amount of electricity. Furthermore, go with a coffee kettle that has temperature options like a variable temperature control that will allow you to set the exact temperature you want your water to heat up too. In addition, there are many models that have a “warm-up” feature that will keep the temperature of the water warm. In turn, this will allow you to save in electricity bill because you do not have to constantly boil on warm your water. It is also significantly more practical to use especially if you are the type of person who always reaches out to your kettle in order to brew a nice cup of coffee. If you normally use your kettle in a small kitchen all with many people around, then you need to consider the noise level. In order not to disturb people around you, go with a coffee kettle that produces the least noise possible. Remember, noise is measured in decibels and most reputable coffee kettle manufacturers should list this value. Auto Shut-Off: The auto shut-off feature is a safety feature you will find in those high-quality coffee kettles. This feature prevents the water from boiling too much and prevents you from consuming too much electricity. Therefore, this feature is not only practical but also makes your kettle more energy efficient. Cordless: A cordless coffee kettle is more practical because it is more maneuverable and you do not run in the risk of your electric cable tangling. 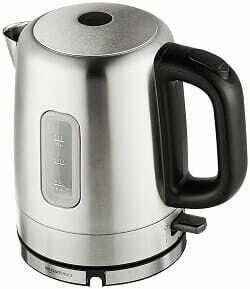 If you normally brew your coffee at a distance from your kettle, then it is best to go with a kettle that is cordless. Sure, it may cost you more, but it is significantly more practical than a corded model. Water Gauge: The water gauge in a coffee kettle will allow you at a glance to see the amount of water present in your kettle. This is a very practical and recommended feature to have. Keep Warm: In order to prevent you from constantly heating up your water, the “keep warm” feature is an absolute must-have! Not only will this feature allow you to save electricity but is also more practical because you do not have to heat up your water again and again which saves you time. Ensure that the manufacturer uses terms like “food safe” and “BPA-free” in their product description. This will show you that the water boiled inside the kettle is perfectly safe and can be used to make any type of food, whether it is for adults or children. Since it can be very difficult to repair a coffee kettle, it is always best to go with a brand that offers you a form of warranty. Most of the time, a one-year warranty on your kettle for coffee is a nice thing to have. Of course, the longer the warranty, the better. As we have seen, the electric kettle for coffee is a very important accessory to have if you are serious about your coffee. It will heat your water at exactly the right temperature so as to brew the perfect cup of coffee. 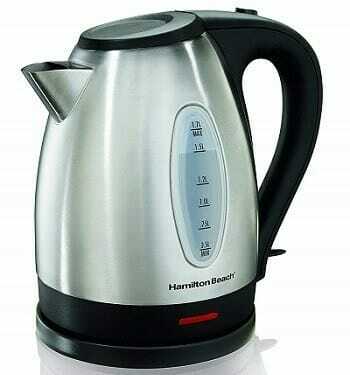 In addition, this kettle is also quite versatile and can be used for other applications where hot water is required. Lastly, if you have read our electric kettle for coffee review above and still not decided on a model yet, then don’t worry. Read the review again!